MINI & INC Ranges to 70°C. 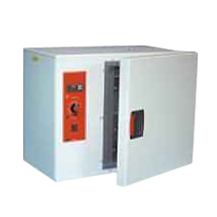 A range of highly efficient, reliable, and uniform temperature incubators. Fitted with a top vent with thermometer clip, fixed shelf runners and removable chrome plated wire grid shelves. 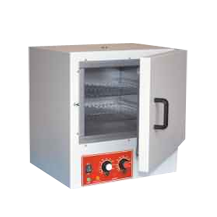 High quality inconel sheathed elements are positioned below the chamber floor for natural convection units, and around the air circulation fan on the back or side wall of the chamber for ovens fitted with a fan. The controls on the vertical style units (MINI) are below the door. On the horizontal style (INC) they are to the side of the door. The controls on the basic smaller MINI models consist of a direct reading thermostat for control, and for safety, an independent adjustable over-temperature protection thermostat is fitted as standard on all models. On all INC models and certain larger MINI models, (or as an option on smaller MINI models), a microprocessor based digital temperature controller with set-point and process display is fitted to provide accurate fully automatic control. Options include: door with viewing window / double doors with internal glass / stainless steel chamber / choice of temperature and over-temperature controls / programmers / recorders / communications / timers / floor stands, etc.